New Pure Brilliant White in Matt, Satin and Gloss have been introduced into the Plastikote Twist & Spray Colour range along with five new on-trend colours – Classic Teal, Duck Egg Blue, Dusty Coral, Lime Green and French Grey. This award-winning spray paint offers any angle spraying, an easy-to-use twist and spray through cap and a large spray button that requires 30% less finger pressure. 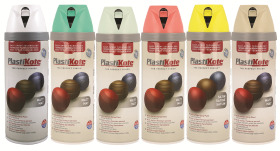 Twist & Spray is available in over 50 different colours and finishes and is perfect for enhancing, renovating or recycling items around the home and garden, says Plastikote.